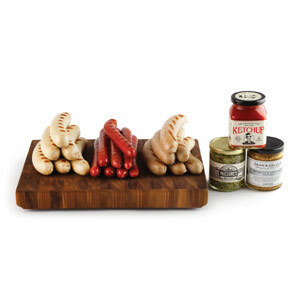 The Wurst With The Works from Dean and Deluca will give you all the links you will need for a great bbq. This assortment comes with 3 mouthwatering kinds – 8 cooked bratwurst (a pork/beef blend sausage in natural casing), 8 bockwurst (pork/veal mixture with whole milk, eggs, and seasonings), and 6 all-beef frankfurters. It even includes a 3 piece condiment collection (gourmet ketchup, garlic/dill relish, mesquite & stout ale mustard). Ummmm!